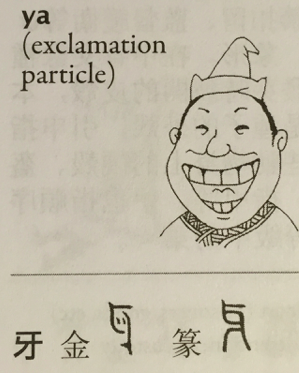 呀 (Ya, exclamation particle) consists of the mouth radical 口 and the phonetic element 牙 (yá, tooth), suggesting a person with an open mouth. 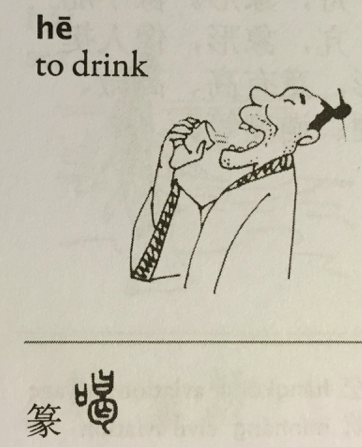 呀 can be used as an exclamation, onomatopoeic word, or an auxiliary. The character 牙 is the pictograph; in Seal Script, 牙 looks like a pair of jaws with two large teeth in the upper part. ASSOCIATE COMPOUND The character 進 consists of the walk radial 辶and the short-tailed bird character 隹 (zhuī). 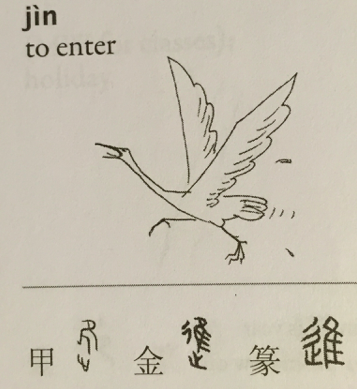 Since birds can only walk forwards, 進 means “move forward,” ”enter,” or “into.” In the simplified character 进, 井 (jǐng, well) replaces 隹 since the pronunciations of 井 and 進 (jìn) are similar. 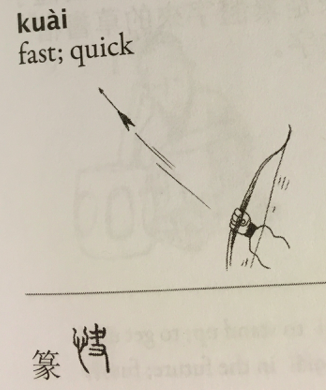 ASSOCIATE AND PICTOPHONETIC COMPOUND 快 is comprised of the vertical heart radical 忄 and the signifying and phonetic element 夬(guài, archery), meaning “fast,” “swift,” “hurry up,” or “soon.” In the Oracle-Bone Inscriptions, 夬resembles a hand and a bow, signifying the act of using a bow and arrow. 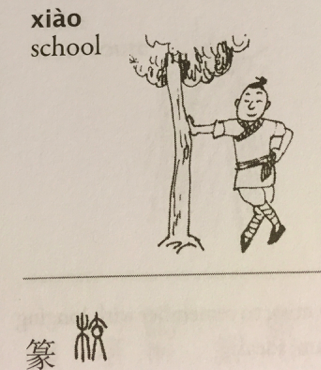 PHONETIC LOAN CHARACTER In its ancient form, 來 looks like a wheat plant. 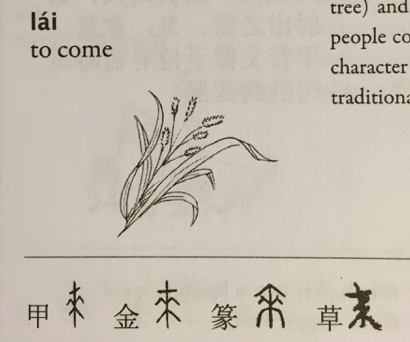 The original meaning of 來 was “wheat,” but later it came to mean “come.” In Regular Script, 来 is the combination of 木 (mù, wood; tree) and two 人 (rén, man; person), suggesting two people coming together beneath a tree. 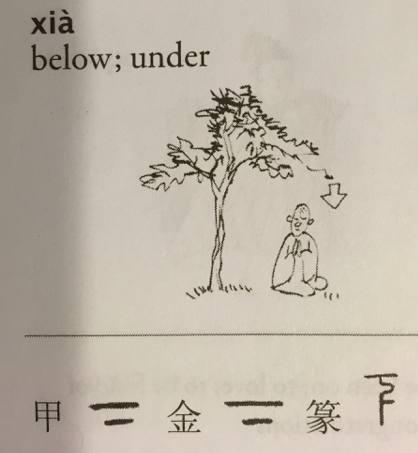 The simplified 来 derives from the cursive of the traditional version 來.
PICTOPHONETIC CHARACTER 紹 consists of the silk radical 糹 and the phonetic element 召 ( zhāo, summon), meaning “continue” or “carry on.” Extended meanings include “to introduce” and “to refer.” The character 召 is the combination of 刀 (dāo, knife) and 口 (kǒu, mouth). The simplified silk radical is derived from the cursive of the traditional radical 糹. Only the radical is simplified in the character 绍. ASSOCIATE COMPOUND In the Oracle-Bone and Bronze Inscriptions, 興 depicts four hands lifting a mold, and meant “to lift” or “raise” (pronounced xīng). 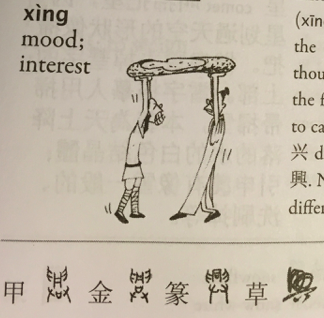 Extended meanings of 興 include “start" "prosper" (xīng), “mood, and “interest" (xìng). In Regular Script, the four hands are still visible in the character 興, though the lower two have been simplified. The part the four hands are lifting is同 (tóng, same). 同refers to castings made out of the same mold. The simplified 兴 developed from the cursive style of the traditional 興. Notice that the top parts of the two characters are different. PICTOPHONETIC CHARACTER The character 漂 consists of the water radical 氵and the phonetic element票 (Piào, ticket). 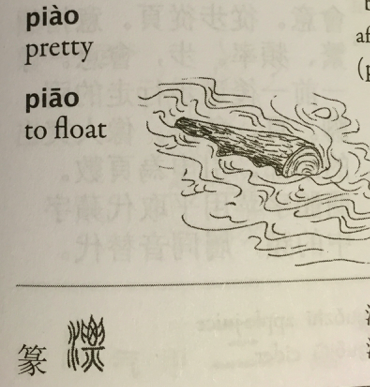 The primary meanings of 漂 include “float,” “drift” (pronounced piāo), and “bleach” (pronounced piǎo). 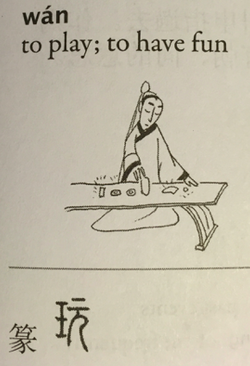 Since cloth looks nice after being bleached, 漂 also extends to mean “pretty” (pronounced piào). 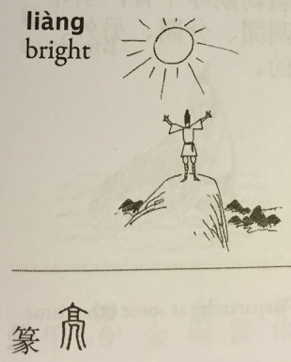 ASSOCIATIVE COMPOUND In Seal Script, 亮 consists of 高 (gāo, tall; high) in the upper part and 人 in the lower part, suggesting a person standing in a high place, where it is presumably also bright. 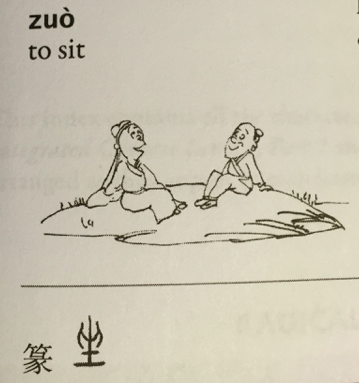 Take care to distinguish 亮 from 高.
ASSOCIATIVE COMPOUND The character 坐 consists of two 人 (rén, person) on top and 土 (tǔ, earth) at the bottom, representing two people sitting on the ground. In addition to “sit,” 坐 also means “to travel by” some kind of vehicle (which one sits in), such as a bus, train or airplane. ​PICTOPHONETIC CHARACTER 哪 is made up of the radical 囗 and the phonetic 那 (nà), and means “which” or “where.” Interrogatives often include the mouth radical 囗, as in 吗 and 呢.
ASSOCIATIVE AND PICTOPHONETIC COMPOUND 校 contains the radical 木 (Mù, wood) and 交 (jiāo, cross) as both a phonetic and semantic component. 校 originally referred to the crossbar that latched the neck and hands of a criminal together. Today 校 is used to mean “school.” In its ancient form, 交 is a pictograph of a figure with crossed legs. ​PICTOPHONETIC CHARACTER The character 喝 combines the mouth radical 口 and the phonetic component 曷 (hé, how; why; when), and means “to drink.” 曷 is a pictophonetic character that consists of the radial 曰 (yuē, say) and the phonetic symbol 匃 (gài, beg; beggar). 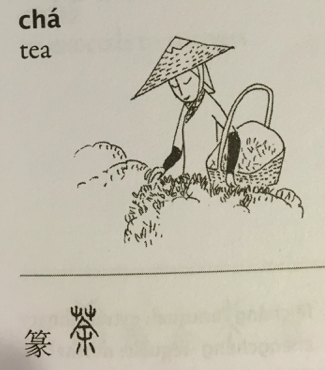 (the grass or herb radical), and the phonetic element 余 (yú), meaning tea. 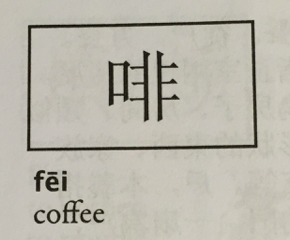 In Regular Script, 茶 contains 艹 (grass radical), 人 (rén, man; person), and 木 (Mù, wood; tree), resembling a person harvesting tea leaves. 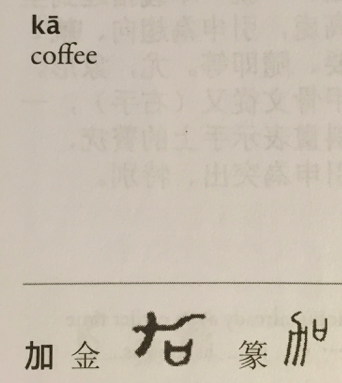 PICTOPHONETIC CHARACTER The character 啡 was created to transliterate some English words, such as coffee (咖啡) and morphine (嗎啡). 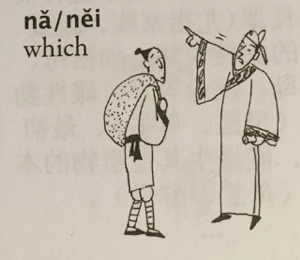 啡 consists of the mouth radical 口 and the phonetic component 非 (fēi). In its ancient form, 非 resembles the two wings of a flying bird. Since these two wings are opposite each other, 非 originally means “run counter to,” and came to mean “not conform with,” “wrong,” “non-,” etc. 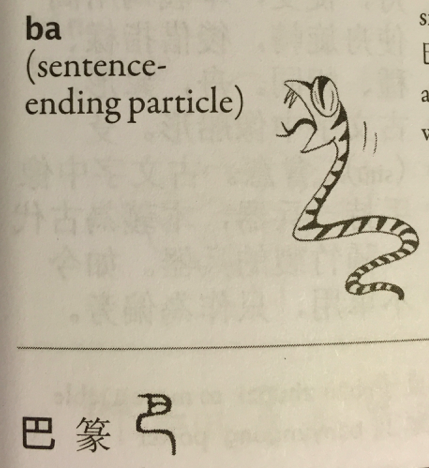 ​PICTOPHONETIC CHARACTER 吧 has the mouth radical 口 and the phonetic element 巴 (bā). 吧 can be used as a question indicator, onomatopoeic word, or particle for making a suggestion. In Seal Script 巴 resembles a snake with a large, open mouth. Today’s meanings of 巴 are still related to the characteristics of a snake, such as “cling to,” “stick to,” and “wait anxiously” (as a snaked waiting for prey). 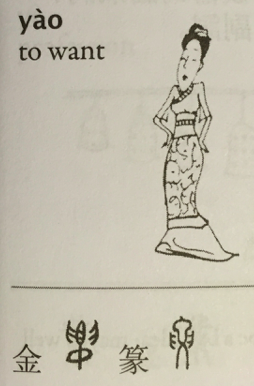 ASSOCIATIVE COMPOUND In its ancient form, the character 要 delineates a woman placing both hands on her waist. 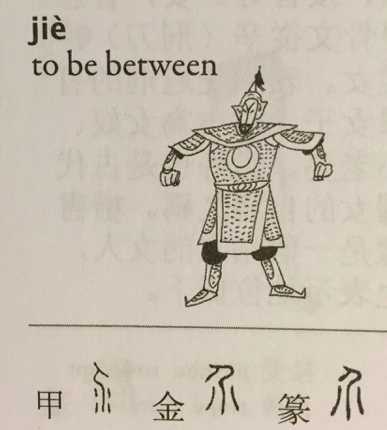 The original meaning of 要 was “waist,” and its meanings now include “coerce,” “demand,” “must,” “want,” “ask for,” and “important.” People often stand with their arms akimbo when demanding something of someone. Later, a flesh radical 月 was added to the left 要 to create a new character for waist 腰 . 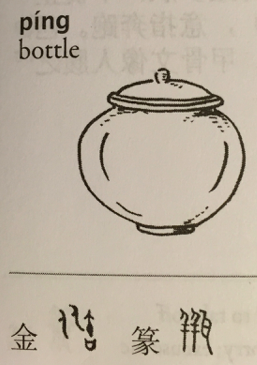 ​PICTOPHONETIC CHARACTER 瓶 is comprised of the radical 瓦 (wǎ, tile) and the phonetic element 并 (bing, side by side; merge), meaning “bottle,” “vase,” “jar,” or “flask.” In Seal Script, the character 瓦 resembles two roof titles. In the Oracle-Bone Inscriptions, 并 consist of two people 人人 and the character 二 (èr, two), indicating two people standing side by side. ​ASSOCIATIVE COMPOUND In its ancient form, the character 要 delineates a woman placing both hands on her waist. The original meaning of 要 was “waist,” and its meanings now include “coerce,” “demand,” “must,” “want,” “ask for,” and “important.” People often stand with their arms akimbo when demanding something of someone. 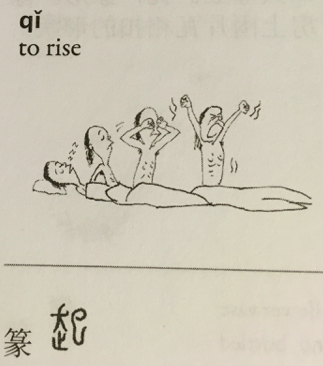 Later, a flesh radical 月 was added to the left 要 to create a new character for waist 腰 .
PICTOPHONETIC CHARACTER 给 consists of the silk radical 糹 and the phonetic symbol 合 (hé, close). 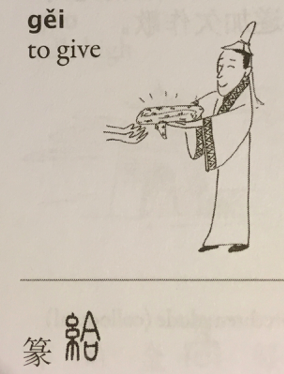 Since silk is considered a good gift, 給 is used to mean “to provide,” “give,” “grant,” and “for the benefit of.” In its ancient form, the character 合 resembled a container with a lid, meaning “to close,” “shut,” “get together,” and “match.” The simplified character 给 contains the simplified form of the silk radical. PICTOPHONETIC CHARACTER 玩 has the jade radical 王 (as a radical, the meaning of 王 is not “king” but “jade;” see the entry for 王 Wáng in Basic Radicals) and the phonetic component 元 (yuán), suggesting jade or something like jade for people to enjoy and play with. The primary meaning of 玩 is “play, ”“have fun,” or “enjoy.” “To visit” is one of its extended meanings. 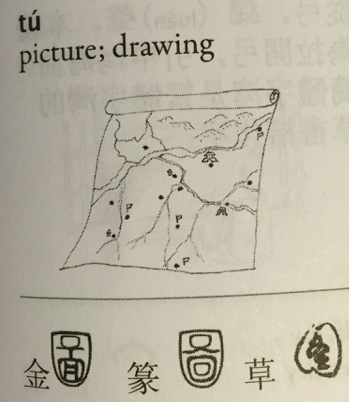 ASSOCIATIVE COMPOUND The character 圖 looks like a drawing of a map in which 囗 (wéi, enclosure) represents the border, while 啚（bǐ) refers to a small administrative district (a unit of 500 households). In Regular Script, the character is comprised of 囗, 十, 回. 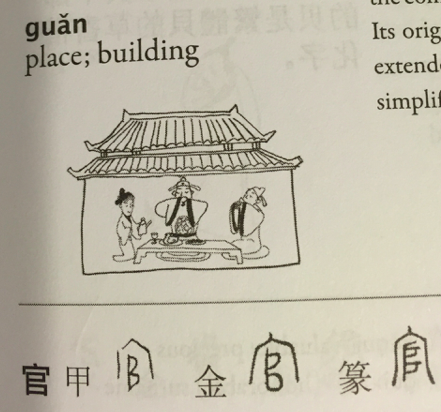 The simplified version 图 derives from the cursive form of the traditional character 圖, the character 冬 (dōng, winter) is inside 囗.
ASSOCIATIVE AND PICTOPHONETIC COMPOUND 館 consists of the food radical 食 and the phonetic and signifying element 官 (guan, official), and means “accommodation for guests.” In it’s ancient form, 官 is the combination of the roof radical 宀 and 官 (duī, hill). Its original meaning was “government office,” with the extended meanings of “public,” “official,” etc. 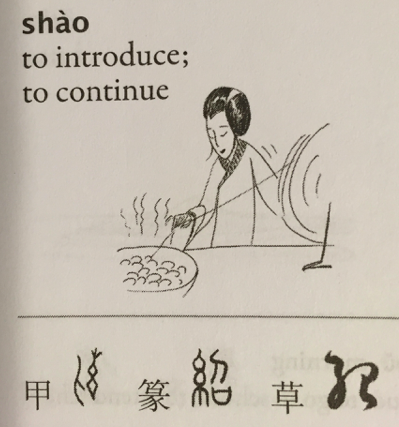 In the simplified character 馆, the food radical is simplified. 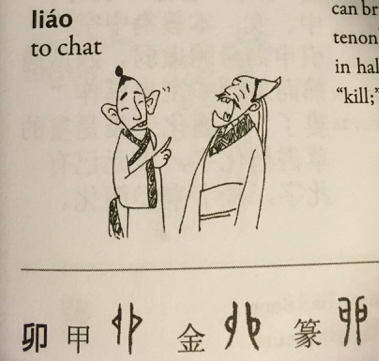 ASSOCIATIVE PICTOPHONETIC COMPOUND The character 聊 is comprised of the ear radical 耳(ěr) and the phonetic and signifying element 卯 (mǎo, mortise and tenon joint), suggesting that chatter and small talk can bring people closer to each other (like a mortise and tenon). In its ancient form, 卯 looks like an animal cut in half. The original meaning of 卯 was “slaughter” or “kill;” “mortise and tenon” is its extended meaning. EXPLICIT CHARACTER The character 才 looks like a seedling just breaking through the ground. The horizontal stroke represents the ground and the part underneath is the root of the seedling. 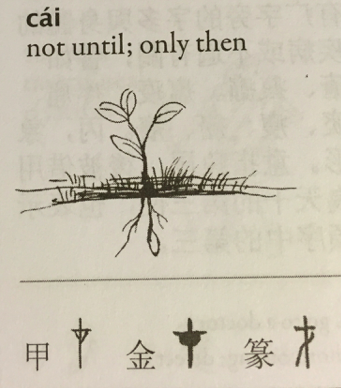 The meanings of 才 include “just,” “only,” “not until,” “ability,” “talent,” etc. ​PICTOGRAPH In its ancient form, the character represents a whirlpool or an eddy. 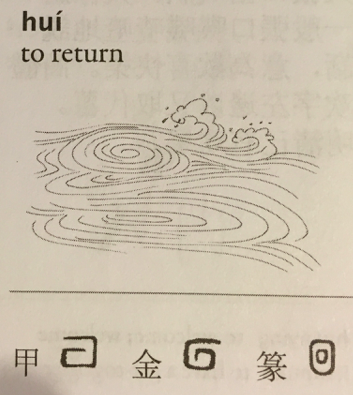 The original meaning of 回 was “whirl” or “circle.” Today it means “return,” “go back,” “turn around,” “reply,” “refuse,” etc.